For the first time biases against gender (male or female)(0.3%) and gender identity (transgender and gender nonconformity which surprisingly ranked among the lowest at .05%) have been added to the FRI’s annual release of statics of hate crimes in America, and next to incidents of racial hate crimes (45.8%), sexual orientation hate crimes came in second with 20.8% with over over 60% of that statistic number accounting for crimes committed against gay males. Today, the FBI released its annual Hate Crime Statistics report, which revealed that 5,928 hate crime incidents involving 6,933 offenses were reported by our law enforcement partners to the Bureau’s Uniform Crime Reporting (UCR) Program in 2013. These hate crime incidents impacted a total of 7,242 victims—which are defined as individuals, businesses, institutions, or society as a whole. 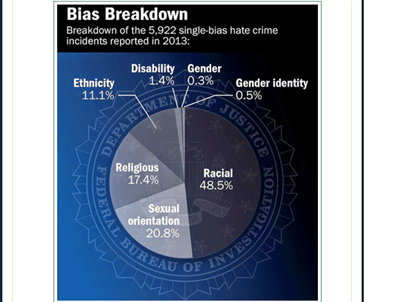 Hate Crime Statistics, 2013—the first UCR publication to contain data collected under the Matthew Shepard and James Byrd, Jr. Hate Crime Prevention Act of 2009—has a few changes from previous reports. First, biases against gender (male or female) and gender identity (transgender and gender nonconformity) have been added to the list of bias categories. And in response to the Shepard/Byrd Act, we modified our data collection so that reporting agencies can indicate whether crimes were committed by, or directed against, juveniles. 60.3 percent were victims of crimes motivated by their offenders’ anti-Jewish bias. 13.7 percent were victims of anti-Islamic (Muslim) bias. 4.3 percent were victims of bias against groups of individuals of varying religions (anti-multiple religions, group). 3.8 percent were victims of anti-Protestant bias. 0.6 percent were victims of anti-Atheist/Agnostic bias. 11.2 percent were victims of bias against other religions (anti-other religion). Our persecution is far from over. Because for a minority that is said to constitute only two or three percent of the population, we certainly get a disproportionate amount of hate crimes directed at us. and this is only the reported crimes. Too often when reported, the quality of the investigation is equivalent to being victimized again.